I tiptoed into the bedroom, and squinted through the darkness until my eyes adjusted. Maggie came into focus just a few feet before me, motionless in her bassinet. She was swaddled like a papoose, her lips curled into a heart-shape. Her brow furled. Her legs curled. She yawned. I gently removed the swaddle blanket as her eyes flickered open, and scanned the space beyond my forehead. A tiny, blue and orange Band-Aid covered her tiny, chubby shoulder, one of two bandages from this morning’s immunizations. Just a few months ago, I never could have imagined what tiny increments would spark the wildfires of my pride. I never could have imagined an outsized love so big it bears repeating over and over and over. At two months, every new gesture is a sign of growth: lifting her head, following objects with her eyes, reaching and grasping. Smiling. 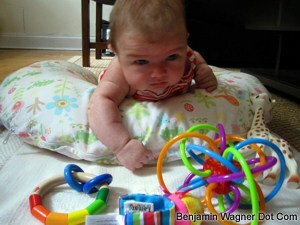 Yesterday afternoon, I lay on the floor as she squeaked and chirped her way through tummy time. She struggled to lift her head, teetering on the edge of laughter and tears, frustration and elation. Finally, with an assist, she grabbed the ball and collapsed exhausted. Used to be that I measured my days in rock songs written, miles elapsed, applause accrued. These days, it’s the small things: a clean kitchen, a freshly-folded load of laundry. These days are measured in small things, like the space between Abbi and me, the times when I lifted my baby girl to my chest, cradle her head in my palm, and delivered her to her mother, smiling all the way. Great post. I live for the small milestones these days. It makes you realize how precious life is and how grateful we should be for every little moment. I’m so happy for you and your wife. All the best with Maggie. My dad and I just watched this… its AMAZING! What a determined little girl. Is she showing signs of being left handed? Congratulations to you and Abbie…the small things are wonderful, and Maggie certainly is a sweetie. Enjoy these moments; it all goes by too quickly.